Contact your county Board of Elections or visit www.VotesPA.com. 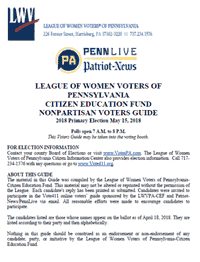 The League of Women Voters of Pennsylvania Citizen Information Center also provides election information. Call 717-234-1576 with any questions or go to www.Vote411.org. The candidates listed are those whose names appear on the ballot as of April 18, 2018. They are listed according to their party and then alphabetically. Registered voters who are ill, disabled, or will be absent from the municipality on Election Day may vote by absentee ballot. Completed applications for civilian absentee ballots must be received by the county Board of Elections by 5 P.M., Tuesday, May 8, 2018. Completed civilian absentee ballots must be received back at the Board of Elections by 5 P.M. on Friday, May 11, 2018. If an emergency arises (unexpected illness or business trip) after the Tuesday application deadline, call your county Board of Elections for information on emergency absentee voting. Proof of emergency may be required. An emergency application and ballot can be obtained and voted by 5 P.M. on Friday, May 11, 2018. Any disabled voter having questions regarding the accessibility of a polling place should consult the county Board of Elections. If you are a new voter or if you are voting at a polling place for the first time, then you must bring your voter ID card or a photo ID such as a driver’s license, student ID or some other form of Federal or State government issued ID. Some forms of non-photo ID are also acceptable such as a firearm permit, current utility bill, bank statement, paycheck, or government check. If you do not have any acceptable ID, then you must be allowed to vote by provisional ballot.